As we all know, pathology is one of the most important pillars of the entire healthcare system. Every day physicians wait for the biopsy results to be delivered to them by the pathology department laboratory. They need the results in order to perform a timely and accurate diagnosis for their patients, as well as to determine the right therapy and monitor their condition. But in reality, this process of acquiring information is often slow. This is due to many reasons. In a pathology laboratory, a lot of time is being wasted on inspecting the glasses and analyzing the tissue samples directly from the glass. This is a real-life example, and it shows us just how much we need technology to accelerate and simplify these basic processes in a lab. And after we’ve seen radiology and other medical disciplines in the healthcare system reaping the benefits of using technology in bettering their efficiency and quality, it seems like pathology is the next in line for modernization. But is that really the case? To find this out, in this post we’ll present the benefits and challenges of adopting digital pathology. 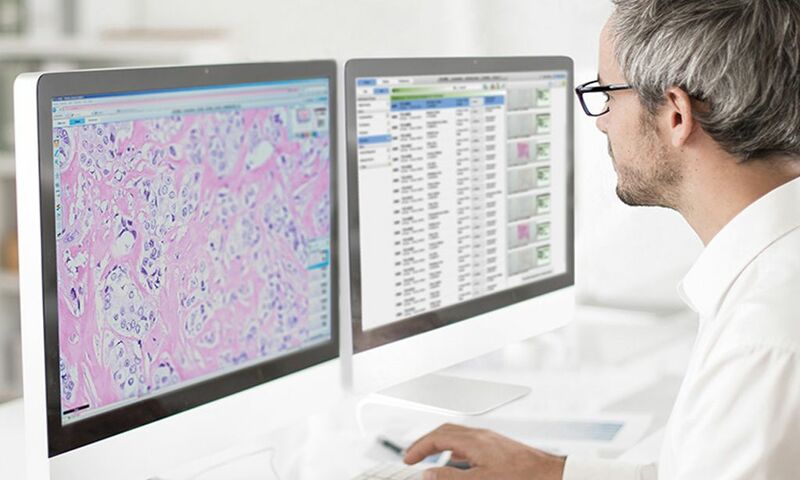 What is digital pathology, and how does it work? Digital pathology stands for using technology in order to speed up and enhance workflow in a pathology laboratory. In practice, it means using advanced digital scanners to capture digital slides, then store them, analyze and share with others. All this is done using the Whole Slide Imaging (WSI) technology, or as some call it “virtual microscopy”. In the first phase, scanners “imitate” a classic microscope and capture digital slides, while in the second phase a specialized software is being used for image viewing and analyzing. So, this process replaces the traditional workflow where a pathologist inspects each tissue on a glass and makes notes and final conclusions. Even though digital scanners were introduced 20 years ago, back then they were very primitive in comparison to today’s modern scanners. Technically speaking, the process of capturing images with modern scanners consists of placing glasses into the scanner. Then, the scanner identifies certain key points on the tissue and scans it piece by piece. Some scanners use linear technology, which is also used for making satellite images, where all images are linearly connected into one image. Other scanners may use squared chips usually found in commercial motion picture cameras. These scanners capture several images in each interval and then stitch them all up into one large image. There are many benefits of implementing a digital pathology system, whether it’s used in a laboratories, universities, or research centers. A digital pathology system, once implemented, will inevitably bring many changes. These changes are imminent because this is a shift from an analog to a digital working process. We witnessed similar changes in radiology some 15 years ago when technology eased the workflow and helped in cutting down the expenses in healthcare. The advantage of digital pathology is using digital scanners and computer software to process, analyze and share digital images of tissues electronically with doctors or entire teams of doctors around the world. Once the image of the tissue is captured, it can be used indefinite amount of times for diagnostics, sharing, and educational purposes. It’s clear that transporting glasses is a delicate matter due to its fragile nature. 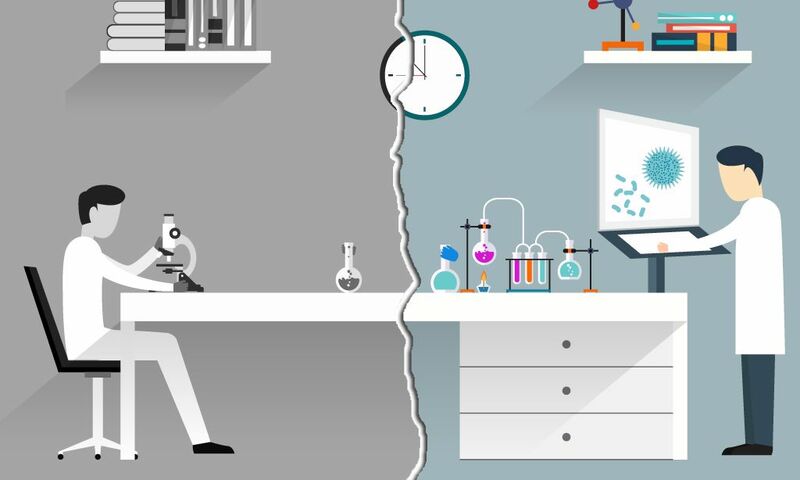 The goal of pathology digitalization isn’t to replace pathologists with computers, but to use computers for menial and time-consuming tasks. This way, pathologists will have more time to spend on making better diagnosis, and for a lab this means more time for improving planning and sample tracking. Also, we need to keep in mind that sending glasses to other locations demands a certain period of time, while sharing a digital image can be done just with a click of a mouse. Digital image can also be used for pathological reports, as well as for result prognosis by using advanced specialized computer software for image analysis. In a paper published on the National Center for Biotechnology Information (NCBI) website, we can find interesting information. They analyzed how implementation of a digital pathology system in larger institutions can significantly cut their costs. In a period of 5 years after implementing digital pathology, expected savings were estimated at 12.4 million dollars for a laboratory that had 219 thousand orders per year. One of key factors is better time management by laboratory staff due to increased productivity. Efficiency and precision of digital pathology system in analyzing tissue images is much higher than the one of a classic microscope. Along with savings, better outcomes for patients were noticed. Each day, more patients are asking their pathologists whether they feel confident about their diagnosis. This puts pressure on pathologists to deliver precise diagnosis in a timely manner, and digital pathology can help them achieve that. The time when a pathologist could know everything is over. Today, with the abundance of patient data available to doctors, it’s difficult to deliver a fast and accurate diagnosis without the help of technology. Digital pathology can make a difference, as it automatizes and speeds up routine tasks which would be impossible for a pathologist to do in a short period of time without compromising quality. As an example, we can mention the story shared by dr. Han Van Krieken from the Radboud University in Nijmegen, Netherlands. He says that once he had a patient with urgent need for tissue biopsy as he was waiting for an organ transplantation. But as dr. Van Krieken had no experience in transplantation pathology he needed urgent help from his colleagues. As soon as he received the biopsy images, he forwarded them via link to his colleagues. One of them was a pathology specialist in the far north of his country, and the other one lived in far west. But thanks to digital pathology, physical distance didn’t matter at all as he had expert opinions of his colleagues on his computer in just an hour or less! Technology found its role in every part of the healthcare system, and that’s a good thing for sure. Laboratory information systems (LIS) are implemented in every even half-decent laboratory, and we can say that LIS is already old news. In institutions where hospital and laboratory information systems are integrated, classic analog workflow makes the pathology laboratory seem like a desert island with no real connection to other hospital departments. 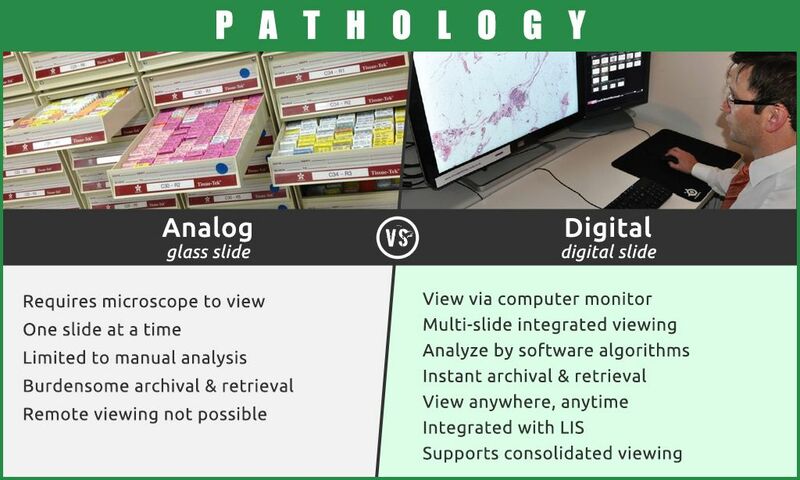 But, if a digital pathology system is installed, it will make sharing digital images an easy task, thus connecting pathology laboratory with the hospital departments and the entire healthcare system. Integration of these technologies into a single powerful digital system is a great platform for creating better multidisciplinary expert teams, organizing virtual meetings, as well as for educating new experts. Well, the answer to that question isn’t easy, as there are many obstacles. These problems, or let’s say challenges, demand to be addressed. We’ll dive into it in our next chapter. Process of adoption new technology is never easy. There are issues to tackle in order to improve pathology. Even though this word may be a bit aggressive, we’ve all had some experience with it in everyday life. Adoption of new computer technologies and trusting them is a big challenge for some people, and that’s ok. They just don’t feel comfortable using them. In pathology, years of working by following standard procedures and workflow, in a familiar environment result in developing habits and “comfort zones”. And truly, pathology is conservative and relies on previously acquired, proven knowledge. Viewing a tissue sample on a monitor screen instead of a microscope is a huge change. In this new digital environment, pathologists need to get familiar with Whole Slide Imaging (WSI) which implies acquiring excellent skills in using digital scanners as well as the specialized software for image analysis and manipulation. This asks for additional education and adaptation. Luckily, this adaptation will be much easier for new generation of young pathologists who are used to using technology in every situation. There are few issues which cause caution and concerns about digital pathology, and they all come back to technology. One of the most important factors in implementing digital pathology is computer hardware. For example, if you use a monitor with bad color accuracy it can lead to inaccurate diagnosis. I’ve mentioned monitors as an example, but in reality it is just one piece of the puzzle needed for completing a successful digital pathology system. It’s very important that the pathology ”workstation” used for viewing and manipulating digital images has the best, or at least adequate computer hardware. Also, capturing high resolution images creates a huge amount of new data. This demands investment in increasing the existing storage capacities. An average laboratory makes 300 to 700 new slides daily, which means additional 1000 GB of data each day. Additionally, having a LIS system implemented will increase the overall data transfer speeds which results in faster process — all the way from capturing an image up to the image appearing on the doctor’s “desk”. It’s quite clear that all these things we mentioned present an enormous financial as well as organizational challenge for laboratories, hospitals — regardless of its size. New technology requires new regulations. Defining clear regulations is key to ensuring high quality and reliability of services. This is true for adopting digital pathology as well. As we already mentioned, processes in digital pathology aren’t standardized yet, and this needs to be addressed. – How will we regulate healthcare modules when one of the four key components of digital pathology, e.g. image capturing is done in one laboratory, but storing and manipulation is done in an entirely new facility? – Will regulation include all diagnostic elements, e.g. will some tissue types, disciplines, methods or analysis be excluded from the regulation? – How do we validate results? As for image format standardization, in the USA this was somewhat resolved few years ago, but we still have no standard harmonization between the USA standards and the ones in Europe or other parts of the world. While we’re on regulation, let’s mention that in April this year, the Food and Drug Administration (FDA) cleared the “IntelliSite” digital pathology system by Phillips Medical Systems for Primary diagnostic use in the USA, which is the first system to get approved in the USA. This is surely a huge boost for digital pathology system adoption in many medical centers. The digital pathology market is growing each day. 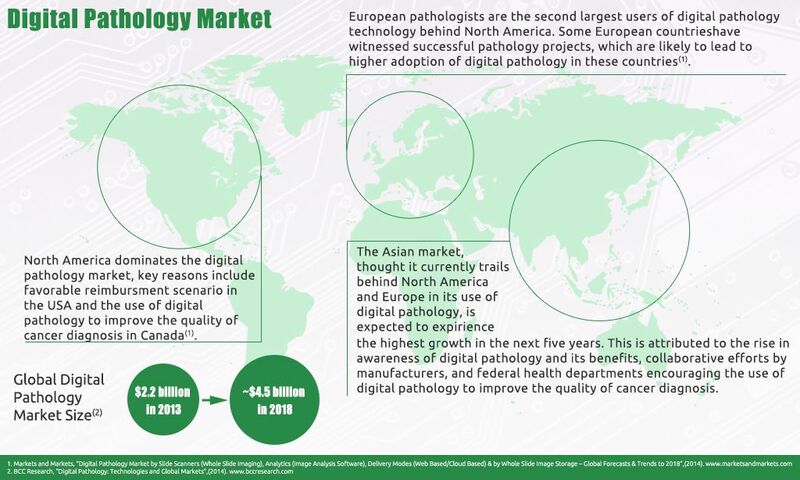 Estimated market growth for digital pathology systems in Europe is huge, and it will increase from 62.23 million dollars in sales (2012) to 143 million dollars by 2019. 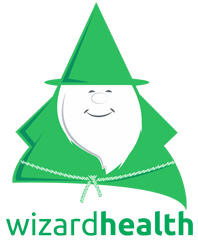 In the USA this growth is even bigger — 205 million dollars by 2019. It’s worth pointing out that in 2011 we had somewhere in between 1000 and 1500 digital pathology systems implemented in institutions around the world, which is still a very small adoption percentage. But still, these numbers are getting bigger each day. Digital pathology is a disruptive technology as it changes the core of processes in pathology. It will enable better primary diagnostic, help pathologists easily access digital images from different sites, and create a platform for better multidisciplinary teams. Also, this technology has a huge potential for educating new generations of pathologists. But of course, there are challenges too. Standardization and regulation of digital pathology isn’t at the point where it should be, and pathologists still have certain problems with adopting this new technology. And we can’t ignore the fact that these digital pathology systems are still very expensive. But as market grows, these systems will be much more affordable for medical institutions around the world. It seems that adoption of digital pathology systems is an imminent process. This technology will surely get better and more affordable in the near future. In the next 5 to 10 years, we’ll see a lot of pathology departments going full “digital”. – dr. Gian Kayser, head of the “Medical Center University” in Freiburg. And in the end, we’re quite confident that dr. Gian is right.